What does a woman have to do to succeed in the world of science? 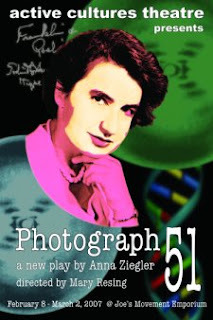 It's 1953 and Dr. Rosalind Franklin, a brilliant and passionate scientist, pours herself into her studies of DNA. But when fellow scientists Watson and Crick find out about her groundbreaking discoveries, her work is suddenly not her own -- and shortly thereafter they claim credit for a major breakthrough. A compelling drama about a woman's life in a man's world, Photograph 51 asks how we become who we become, and whether we have the power to change. The show runs February 8 - March 2, 2008 at Joe's Movement Emporium in Mount Ranier, Maryland. See the Active Cultures web site for details.